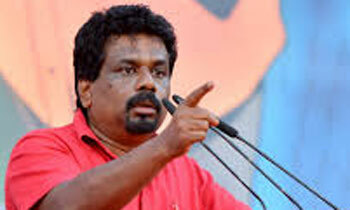 Janatha Vimukthi Peramuna (JVP) Leader Anura Kumara Dissanayake said yesterday even though they would not be able to restore the economy that has collapsed just by winning the Local Government elections, they were using it as a stepping stone to gaining power in 2020. He told the JVP’s final rally held in Maharagama yesterday that its election campaign was a resounding success which would guarantee a remarkable victory for them while the vote base of the UNP, the SLFP and the SLPP were sure to decline at these elections. He said the JVP’s campaign against fraud and corruption during their election campaign had forced other parties to base their campaigns on it as well. He said this was despite the fact that the leaders of these parties, President Maithripala Sirisena, Prime Minister Ranil Wickremesinghe and former President Mahinda Rajapaksa, being engulfed in a cycle of fraud and corruption for the last seventy years. “Ex-President Rajapaksa said he would not allow members elected to LG bodies from his party to undertake contracts. The Prime Minister was forced to remove MP Ravi Karunanayake as assistant leader of the party. President Sirisena also started bragging about fraud and corruption while keeping fraudsters and corrupt individuals on his stage. It is the JVP that forced them to centre their election campaigns on fraud and corruption whereas they started with other slogans such as the risk of the country being divided and the Prime Minister issue,” he said. Mr. Dissanayake said that governments that ruled the country so far had been engaged in massive fraud, corruption and misuse of public money and stressed that the JVP was committed to putting a stop to that culture of impunity. If the stone is slippery............? A long long dream since 1970.
i will support JVP forgetting all past things but you need to come with a long term strategy and people who can go international. you cannot live alone in this world. get good professionals to your party to contest. be radical. What ever said and done these people stands tall when compared to all the crooks in the 2 main parties.Its better to give them the power of the village to test their capabilities. They have good experience in Opposition doing sabotage. They are with Doctors and topple the innocent people's life.